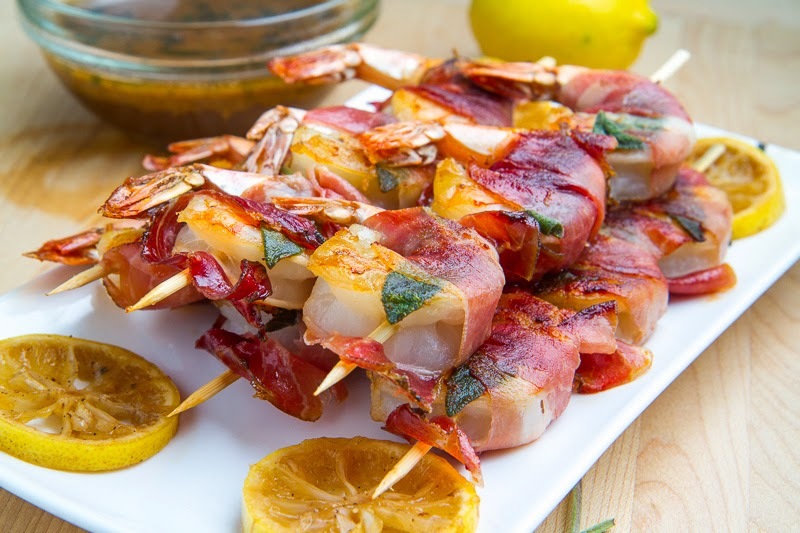 I recently came across the idea of shrimp saltimbocca by tide and thyme on pinterest and when I did I immediately knew that I would have to try it! Saltimbocca is a tasty Italian dish where veal is cooked with prosciutto and sage that is either pinned to the outside or wrapped up in the middle. I like a chicken version where the prosciutto is wrapped around the chicken with the along sage leaves and both the prosciutto and the sage get nice and crispy on the outside of the chicken as it cooks. 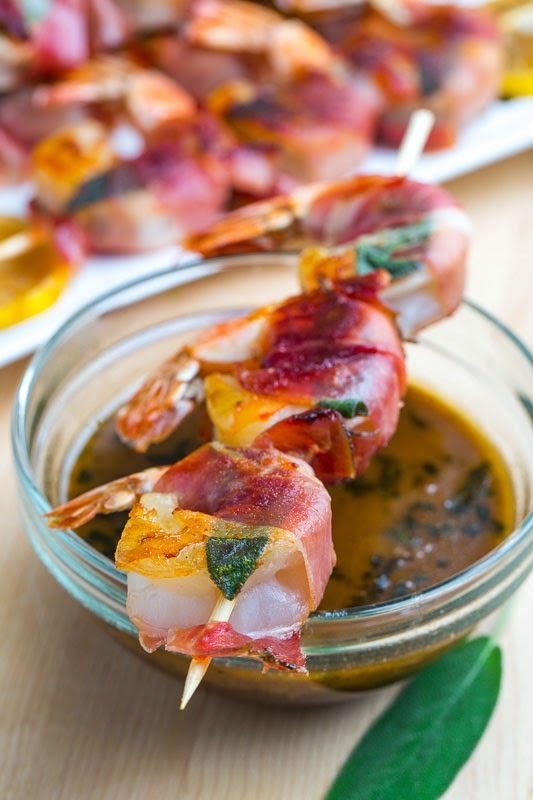 You really can’t go wrong wrapping chicken in crispy fried prosciutto and sage and I knew that a shrimp version would be just as good if not better! 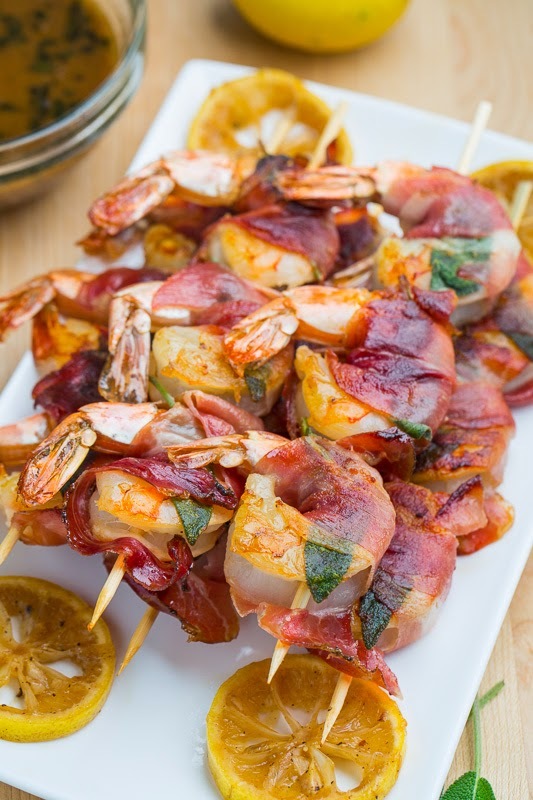 The shrimp version takes a bit more time to make since you have to wrap all of the shrimp up with small sage leaves but other than that it is super easy! Once the shrimp has been cooked the bottom of the pan is covered in those little brown bits of flavour which you just cannot let go to waste so I made a quick pan sauce with some browned butter, wine and lemon juice along with the crumbled bits of some crispy fried sage. 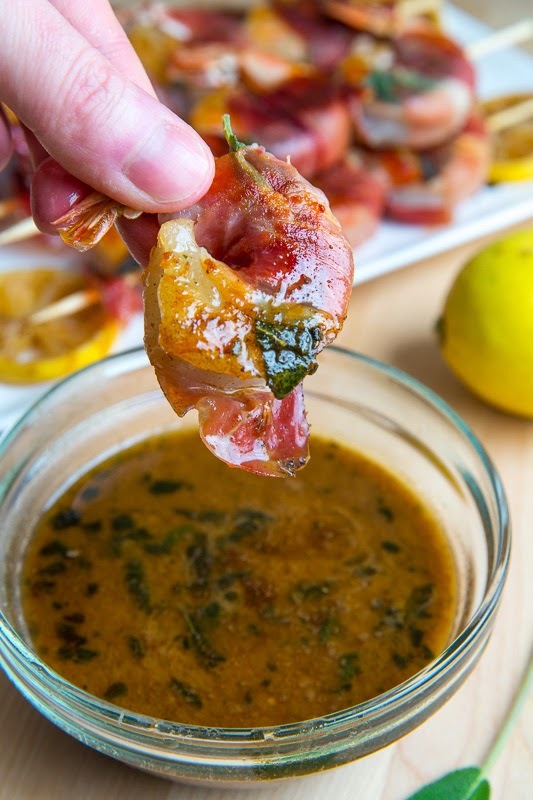 This shrimp saltimbocca along with the buttery lemony pan sauce would be perfect tossed with pasta for a meal but I decided t go a different route and served it as appetizers along with the pan sauce for dipping. This is some of the tastiest shrimp that I have had in a while! I tossed some additional lemon slices in with the pan sauce as it simmered down for presentation. 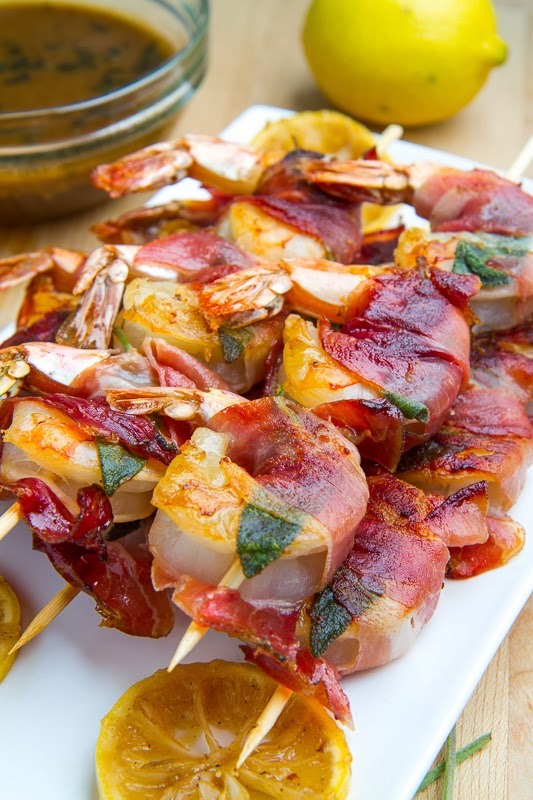 Note: I like to use 21-25 count shrimp for this giving about 8 skewers with 3 shrimp on each. Option: These shrimp and the sauce, optionally with the addition of capers, would also be great tossed in pasta to make a meal out of it! Delicious-looking shrimp! Hope you have a very Happy Thanksgiving! !